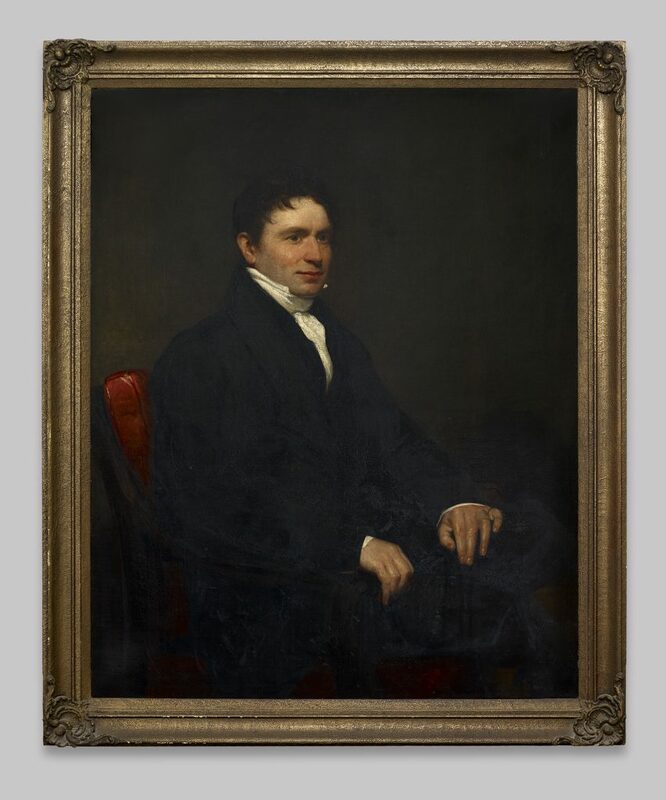 Below is my blog written for the People’s History Museum (PHM) in Manchester – celebrating their acquisition of the portrait of Hugh Hornby Birley. The PHM has a great exhibition – Disrupt? Peterloo and Protest that runs until February, 2020. To complement the display of a portrait of Hugh Hornby Birley, who as captain of the Manchester and Salford Yeomanry played a central role in the events that unfolded at the Peterloo Massacre, we asked author Jeff Kaye to share his research on Birley from his forthcoming novel All the People and treat us to an excerpt about the painting, now in People’s History Museum’s (PHM) collection. 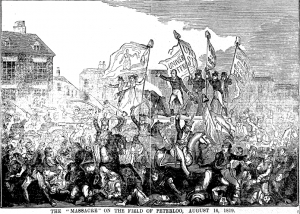 ‘It may be hard for us to imagine the carnage at St Peter’s Field at the Peterloo Massacre on 16 August 1819, when the Manchester and Salford Yeomanry led by Captain Hugh Hornby Birley rode into the crowd, sabres cutting, killing men, women and a child, injuring almost 700. Thereafter, the survivors and their supporters who wished to commemorate the tragedy of Peterloo were not allowed near the site of their grief. The field was blockaded by the 15th King’s Hussars, the regiment that supported the yeomanry into battle in 1819, stationed nearby at Hulme Barracks. Therefore, on each anniversary of Peterloo, crowds of working people would gather outside a house in Mosley Street and also at Chorlton Mill, now apartments at the junction of Cambridge Street and Hulme Street. There, they would jeer at the symbols of the man that led the charge at Peterloo, the faceless buildings owned by Hugh Hornby Birley. 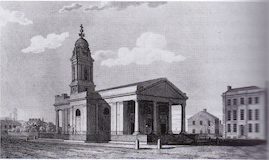 The authorities considered him guiltless and it was not until April 1822 that a private prosecution was brought by Thomas Redford, a Middleton hatter, against the promoted Major Birley and others, for ‘assault’ at St Peter’s Field. The prosecution failed and Birley must have believed that, at 44 years of age, the shadow of Peterloo had lifted. Birley was already a successful businessman in Manchester, based on the success of Chorlton Mill, the area’s main employer. He was also a civic leader, the founder of the Manchester Chamber of Commerce and spokesman for the Manchester Association of Master Manufacturers. He used this platform to vigorously oppose Ten-Hour reform: his reputation as the harshest of employers was well earned. He also despised interference by the state into his private affairs, except for the wholesale reduction of the tax on corn because he considered taxation was required to fund his cherished military. As the Treasurer of the Lying-in Hospital (later transformed into St Mary’s Hospital on Oxford Road, Manchester) for 30 years, he may also have considered himself a philanthropist, if a giver of time rather than his money. But this was insufficient to persuade working people to suspend their hatred. Indeed, many of Birley’s own class thought him contemptible, including Archibald Prentice, Editor of The Manchester Times newspaper and Founder of the Anti-Corn Law League with Richard Cobden. Cobden donated land at St Peter’s Field for the building of the Free Trade Hall; considered a cenotaph to Peterloo and a snub to Birley. Birley attempted to build a wall of respectability to change memories. His business activities, work for the town and his philanthropy were likely designed, at least partly, to alter how he was remembered rather than compensate for any guilt, which he never admitted. Such efforts were doomed to fail. In 1842, cotton mill workers, striking over starvation wages and the Chartist cause of universal suffrage, came to Chorlton Mill. 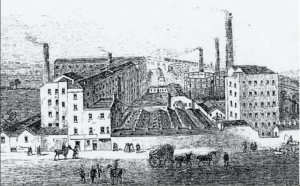 Throughout the Plug Plot Riots of 1842, other mills across the North West closed without a fight, but Birley’s mill was defended vigorously against the strikers with water hoses fired and masonry thrown from the roof, causing the death of a young girl. The mill was nevertheless closed. ‘He walked to his painting…Yes, he had looked mightily content with himself, he thought, all those years ago, self-confident and secure, almost overbearing in his towering self-belief. Yet now, as he reached into his final years, he was conscious of an insecurity that he had never allowed to surface. He was standing with some difficulty, exhausted, shaking with the strain of life pressing on his shoulders. He inched closer to inspect the painting. It showed a man in his prime, at the height of his physical wellbeing, he thought, yet with eyes that could not look into his own. He wondered how he would be painted now? His physical form would show him fatter, for certain; redder of face, definitely; balding, of course. But, underneath the external signs of ageing, how would the artist seek to show the inner self? Would he portray the man of destiny, the yeoman, forever undertaking what was right and proper for God, his King and his country? Or would he betray the man, maltreated throughout his life, misunderstood, drenched in a guilt that he would never acknowledge, eyes unwilling to make contact with even the artist himself? Jeff Kaye is the author of the forthcoming novel, All the People. 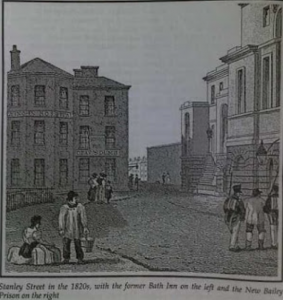 It is a story of the fight for survival by Manchester people between the Reform Act of 1832 and the Plug Plot Riots of 1842, due for publication in the autumn of 2019. During the last 15 years, Jeff’s work within international Non-Government Organisation’s such as Global Witness and Transparency International added greatly to his interest in Britain’s development. All the Peopleis the outcome. He previously wrote Last Line of Defense about corruption in America, following his earlier career in hi-tech industries. Jeff is a graduate of the University of Manchester. A portrait of Hugh Hornby Birley is on display in PHM’s new exhibition Disrupt? Peterloo and Protest until Sunday 23 February 2020. The exhibition is part of PHM’s year long programme exploring the past, present and future of protest, marking 200 years since the Peterloo Massacre; a major event in Manchester’s history, and a defining moment for Britain’s democracy. The exhibition is supported by The National Lottery Heritage Fund. People’s History Museum is open seven days a week from 10.00am to 5.00pm, and is free to enter with a suggested donation of £5. Radical Lates are the second Thursday each month, 10.00am to 8.00pm. Whether, over two hundred years’ later, the success of the revolutions is properly signalled by the visit to France of the popularist Donald Trump is highly questionable for his visit signifies a distinct darkening of how democracy is faring in the USA, Europe (post-Brexit referendum), Turkey, the Phillipines, India, China, Russia, Saudi Arabia, Israel where serious strains are being felt and ‘strong man’ politics is under way. It may be straining credibility to equate these dark concerns on democracy with the election of Norman Lamb, a Liberal Democrat Member of Parliament, to the position of Chair of the House of Commons Science and Technology Committee, a Committee whose purpose is to scrutinise the UK Government on its strategy and programmes in this area. Yet, this linking of science and democracy is central to the changes we are currently seeing in the world of politics. ‘Science in the Soul‘ is a collection of the writings of Richard Dawkins, where he shows his distinct ability to reason and explain to the full. In the book, Dawkins commends the science populariser, Carl Sagan, as a man that should have won the Nobel Prize: not for science but for literature and it made me re-read his excellent book ‘The Demon-Haunted World‘, published around twenty years ago. If an afterlife existed, Carl Sagan would be looking down at the events of 2016, and tut-tutting knowingly, shaking his head and pulling at his long, white beard (all sages have long, white beards in heaven, don’t they? ): “I did tell you guys!” he would be shouting, hoping that some mystical ripple would resonate from his screams of despair into our heads, deaf and dumb to all sense. In the so-called developed world, technology moves forward at a great pace so that major phase transition events bypass us with alacrity. The whole ‘fake news’ environment washed over us only in the last few years as the networked world provided everyone with the ability to be journalists and have an opinion that all can see. As always with new technology, those most capable of utilising it to advantage included the criminally-minded who not just sent emails from Nigeria asking for your money, or emails and texts that would lock up your computer or cellphone if you replied but, more subtly, perverted voting systems and swayed voters by their ability to infiltrate the social networks with lies, distortions and manipulations to a precision that a few thousand votes in the right States resulted in a Trump presidency. Discount ‘authorities’ who generally carry no weight; in science there may be experts, not authorities. In politics, beware such experts. Now, not everyone has the time to go out and do all this. So, we rely on journalists and others to do so. This brings me back to Norman Lamb, a man who has gained tremendous respect across all parties for his honesty and campaigning zeal (in the area of mental life as an example). He is a democratically-elected member of a Parliament often thought of as the home of democracy (Thomas Paine might have doubted that and the first-past-the-post system of elections means that most in the UK are, effectively disenfranchised) and now Chairs a Committee on Science and Technology. We should be using such institutions to galvanise the linkages between science, technology and democracy to challenge ourselves in how we think so that crass assertions made during the Brexit referendum and by Donald Trump and others (that might lead to the USA’s desertion of the Paris Agreement on environment as just one example) are challenged by not just politicians but by all those that should hold us to scientific thinking. This means that we should understand why those that wish to believe in such perversions of reality actually do so and why scientific thought processes are so easily overturned, that ‘rigorous scrutiny’ is accepted as the norm. A recent article in the Financial Times, by John Gapper on how CP Snow identified the gap in thinking on science by intellectuals in the 1950’s shows that this is not new, but it is not just intellectuals that have the vote in the 21st Century, it is all the people. So, a plea to Norman Lamb and his Committee, whatever the Terms of Reference have historically been, it is time to challenge our lack of scientific thinking, the lack of awareness of science and technology throughout the population and how this “combustible mixture of ignorance and power is going to blow up in our faces” – if it hasn’t already. Democracy took many lives and many years to establish in the western world and elsewhere. It is not yet extinguished but, like a candle that has been burning for many hours, the light is in danger of failing. Sagan’s book was sub-titled: “Science as a Candle in the Dark”. On the day the French commemorate its own democracy, we should not let that candle flutter to extinction. Yesterday, 9th December, 2016, was International Anti-Corruption Day and many newspapers and journals used it to publicise the most venally corrupt nations, often those in Africa and the Middle East viz. NY Times. These are developing nations, highlighted by Transparency International’s Corruption Perception Index, where those affected by corruption are most at risk of its exploitation by their leaders. What Laurence and Anne-Christine have done is to shine a light on the developed West, where corruption remains a standard and where the mechanisms that enable corruption around the world, such as highly proficient banking systems, legal and accounting expertise, sophisticated technologies, exist to maximise the ability of those throughout the world to illegally and immorally syphon billions, possibly trillions, of dollars, pounds and euros away from legitimate ownership. This is an important work that provides the bedrock of understanding for those who are interested in dealing with corruption to dig further into the subject. It highlights the enormous degree of corruption in the Americas and Europe, from political to banking, from sport to business to organised crime in a highly readable way but one that provides important information, not gloss. It also shows the huge challenge where, even in highly developed, wealthy economies, the desire to have more seems undiminished. Laurence was a founder of Transparency International (TI) and Anne-Christine was a deputy director of Transparency International’s worldwide Defence and Security Programme (DSP). I am privileged to be both a Trustee of TI-UK and Chair of DSP, so I know the contribution both have made and also the huge work that still needs to be made. The book is an important balance for the anti-corruption world. Corruption is not just in poor countries and, where grand corruption is concerned, the West is involved with the developed world anyway in financing the corruption and in enabling aspects of it such as money laundering. Together with the corrupt practices that appear to be endemic in the West, such as in lobbying, sport, political favours, business, crime-related, the West has a massive anti-corruption agenda to fulfil and knows it. Three things, amongst many, cry out for action. First, there is the need for politicians and business people at the highest level to be far more active and vocal in this area. This includes their associations, such as Chambers of Commerce in the USA that are actively trying to water down the Foreign Corrupt Practices Act to dumb down the level playing field and make corruption easier. Beyond this, politicians in wealthy countries are too devoted to increasing GDP at any cost and the danger is growing that the ethics of doing business will be adversely affected as a direct consequence of the inequalities caused by the banking crash of 2007/8. Brexit and Trump are such outcomes and, viewed from the anti-corruption side, harrowing in their potential. Second, the resources that are provided to implement and manage the laws that politicians might deliver on are woefully inadequate for the task. If legislatures enact new laws to strengthen anti-corruption norms, it is the execution of the laws that fail so often through inadequate expertise and sheer money provided. Third, it is time for anti-corruption to be seen as a positive economic benefit. Corruption is bad for the wealth of the broad population, assisting only those at the top of the tree. In a world that seeks to reduce inequality and where voters are making their positions clear that they will not tolerate their position for much longer, intelligent politics and business (and development aid) means reducing corruption becomes more important. It is a key method of increasing economic well-being by ensuring that enormous flows of corrupt money stays in countries that require it as well as in the economies where it can be properly used rather than syphoned into a tax haven bank account where it remains as dead money. In an age where the velocity of money is slowing, corruption remains a cause of economic decline. Unmasked comes as at important time, just as the world is turning in on itself. The West should learn the lessons that are described so well in the book and use this difficult period to ensure that the first gear in which it has for so long been engaged is kicked into second and upwards not into reverse. The Independent today (3rd October) reports that the Foreign Office is placing human rights below trade in its international efforts. Sir Simon MacDonald, Permanent Secretary at the Foreign Office, said this to the Foreign Affairs Select Committee, chaired by Crispin Blunt – a Conservative MP. The outrage to this frank admission from those like Amnesty International is understandable but the news is not a surprise. The UK has a default mechanism – overseas trade at almost any costs. It is this default that has, at times, been tempered by those heading our foreign ministries (such as Robin Cook and his “ethical foreign policy” and Douglas Hague more recently) but over more than 200 years, Britain has pursued a trade policy which has been usually unyielding. From the 17th Century onwards, this island nation has pursued conquests and material gain in overseas territories that enabled a minor nation (by population) to erect a massive empire. It was a mixture of bravery, opportunism, single-mindedness and adventurism that took Britain throughout the world as searchers for new lands and the rewards that would come with them. Along with the supreme invention of the joint-stock company that somewhat de-risked such ventures, companies like the East India Company not just took advantage of these overseas territories but set themselves up as military governors of them. This company ruled India until as late as 1858 (after the rebellion of 1857). From then on, British military might was handled directly by Government. Thus, the mercantile underpinning of our international trade, by then as much as the need to export the produce of the industrial revolution as the need for raw materials, was in place. This was an extrovert linkage between might and trade in the nineteenth century, now it is implicit. 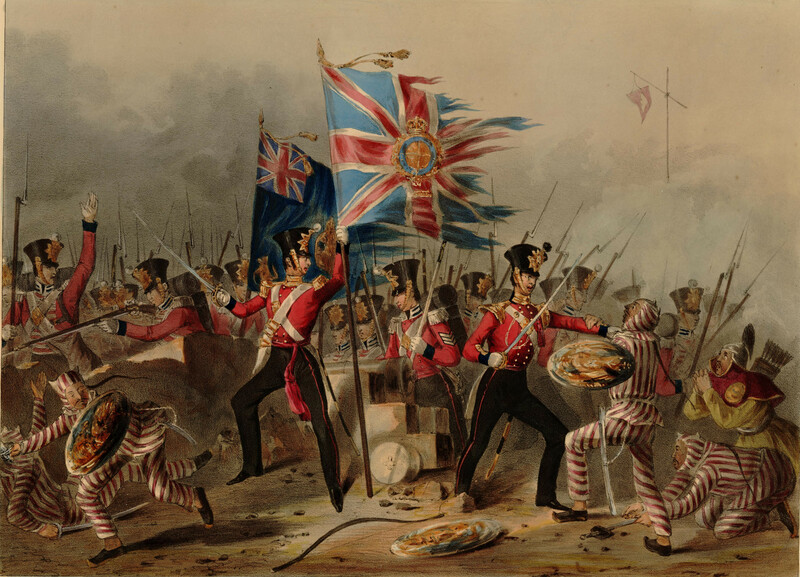 One of the worst examples of mercantilism were the Opium Wars in China where Britain fought to ensure that the sale of opium into China would continue. More recently and especially since the end of World War II, when British military might was used to vanquish an evil Nazi regime and almost bankrupted this country, Britain has used its ability to aid overseas trade more subtly. We have now ceased to follow the Palmerston gunboat diplomacy of the nineteenth century but our ability to promote trade along with military capability is still firmly in place. For much of the twentieth century an example was the Defence Services Organisation (DSO) that promoted our arms exports throughout the world. This was an effective sales force for arms exports that retained the UK’s ability to remain in the top three or four internationally until very recently. Our embassies were (are?) and our military attaches in particular represented not just our Government but the companies that sought to trade in the countries where they were situated. Alongside this, the UK has developed a record on human rights that is one of leadership on a world-wide scale. In the nineteenth century, our Gladstonian free trade mindset was tempered with a humanity in a section of the population that sought to restrain the might of an empire and restrict its natural tendency to the Benthamite utilitarianism that sought to consider overseas peoples as no more than collateral. While we may seek to measure natural resources in 2015 as “natural capital”, in the nineteenth century, even after we abolished slavery in Britain in 1809, we would still value people our dominions numerically as we would a piece of equipment. Liberal Free Trade was built on this and while Tories (Conservatives) may have initially tried to stem the Free Trade tide (because of their natural affinity to those that ruled by their ownership of land), they became as fervent in their pursuit of capitalism and mercantilism until now they have adopted the mantle to themselves. So, while this country spends 0.7% in overseas aid (and trumpets this, rightly, as an example of our desire to alleviate poverty and disease), in this progressively post-Industrial world (where all countries are now so interlinked by trade) we maintain an extraordinary linkage to many tax havens around the world that ensure that companies can reduce their tax burdens at the expense of much of the world’s poorest. London is itself a crucible of money laundering and Tax Justice Network assesses London and its affiliated tax havens in places such as the Cayman Islands, Jersey, British Virgin Islands and elsewhere, as the most secretive combined jurisdictions in the world. This is today’s example of the UK and its desire for financial trade above the rights of the poorest. Since WWII, the UK has (as stated above) been at the forefront of much that is good in the development of human rights world-wide. Apart from our leadership in the establishment of UN and other basic norms for human rights, this country houses many NGOs that lead in this sector. This is now at risk. Not only is the current government suggesting that we opt out of various human rights bodies (unable it seems to allow ourselves to be subject to best-case international norms), not only are we potentially removing ourselves from the historical capability of being a home for immigrants that are subject to terror in their own countries, but we are looking to enhance our ability to trade in nations that continue to abhor basic human rights in their own countries. This is a pandering to economic welfare and materialism that has not been seen since the days of Bentham and the focus on such utilitarianism (then at the expense of the poor working class in this country but now internationalized) is a stark throwback to the default mechanism of our forbears – those who maybe knew they were wrong but had no experience to turn to. Now, we have no such excuses. The desire to trade unabashed world-wide and not concern ourselves with the dire consequences of the countries with which we trade points to a shallow materialism that is in danger of throwing aside all that so many have worked for so many years. That this country, one of the world’s richest, should consider that the problems faced by those in the countries with which we do business are not of any concern to us is not just wrong but a short-termist mistake. George Osborne’s recent visit to China is a good example of this. He is not just a head of finance but a senior Cabinet Minister that goes with the blessing of the Government. He left China with the endorsement of the Chinese government as voiced through their newspapers for not overstating human rights issues. Apparently, the UK cares less about people than about profits or increasing our GDP. So, Mr MacDonald’s statement before the Foreign Affairs Select Committee is no surprise but it is a statement that will have chilling effects. It states that we are giving up our responsibilities on the back of a desire to enrich ourselves at the expense of those outside the UK that suffer oppression and poverty. While we maintain out 0.7% (although some of that is being deflected into defence spending) much of that, in effect, buys us more ability to sell products and services. Robin Cook did not last long in office as a result of his ethical foreign policy beliefs. We no longer even hint that this remains our aim but the lesser aim of maintaining human rights and challenging those that do not follow our example is now not just under threat but clearly is seen as history. It may be that quantity of life is the belief of this government (and the defocusing on climate change is another example) rather than quality of life and the desire to lead lives that are worth living. We do have average levels of material wealth in this country that are envied in many countries and much that our democracy and ability to live relatively freely within out nation that propels many to want to live here. Yet, in a global economy, it appears that materialism is now the only objective as we go back in time to the nineteenth century. This time, we have no excuses. Human rights as enshrined in the United Nations Declaration of Human Rights are essential components of how we should not just run our own country but how we should see the world.